The formula for economic growth is clear enough: more workers, improved human capital as measured in education and experience, high levels of capital investment, and ongoing adoption of new technologies, all mixed together in a market-oriented economic environment that provides incentives for work and innovation. The problem for the U.S. economy is that all of these factors are looking shaky for the decade or two ahead. Brink Lindsey lays out the issues in "Why Growth Is Getting Harder," written as Policy Analysis #737 (October 8, 2013) for the Cato Institute. For example, when it comes to the quantity of labor in the U.S. economy, it's become well-known that that the share of adults who have jobs or are looking for them--the "labor force participation rate"--has been dropping for most of the 21st century and dropping faster in the Great Recession and its aftermath. 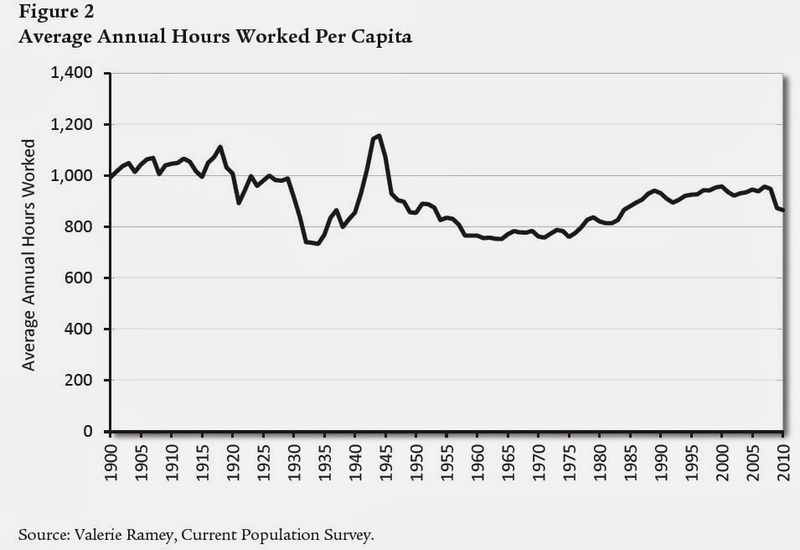 Lindsey offers an interesting graph of per capital hours worked. This measure takes into account changes in the share of adults working, as well as changes in the work week. 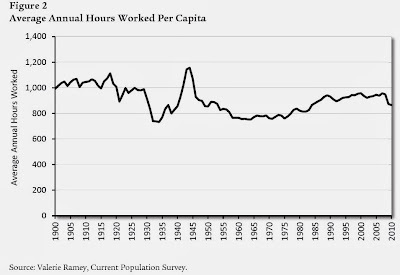 Looking at this graph, and thinking about the ongoing retirement of the Baby Boom generation, it's hard to think that a surge in hours worked will be a main driver for future US economic growth. When it comes to capital investment, it's been true for decades that the US is a low saving and low investment economy by the world standards. 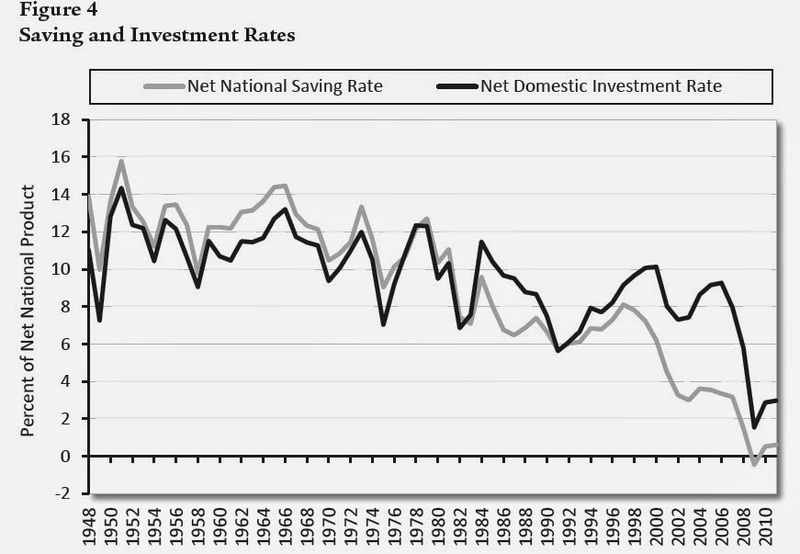 Maybe at some point in the future these trends will turn, so that Americans save more and the U.S. government borrows substantially less, both leading to more funds for domestic investment. 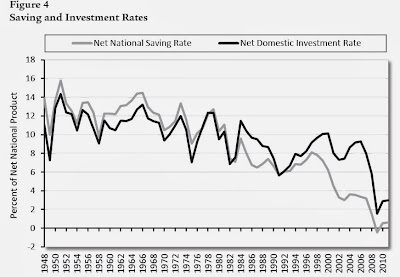 But it's hard to look at this long-run pattern and think that a surge of saving and physical capital investment will be a main driver for long-run U.S. growth. Along with physical capital, it's at least as important to invest in human capital, a broad term that include both education levels and skills gained through job experience. U.S. adults as a group tend lag behind the average of other high-income countries when it comes to literacy, numeracy, and problem solving. 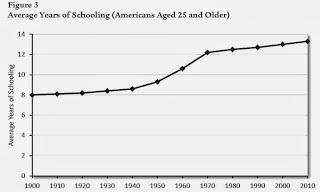 This graph shows that while the U.S. had a surge in educational attainment between about 1930 and 1970, the change since then has been much more modest. 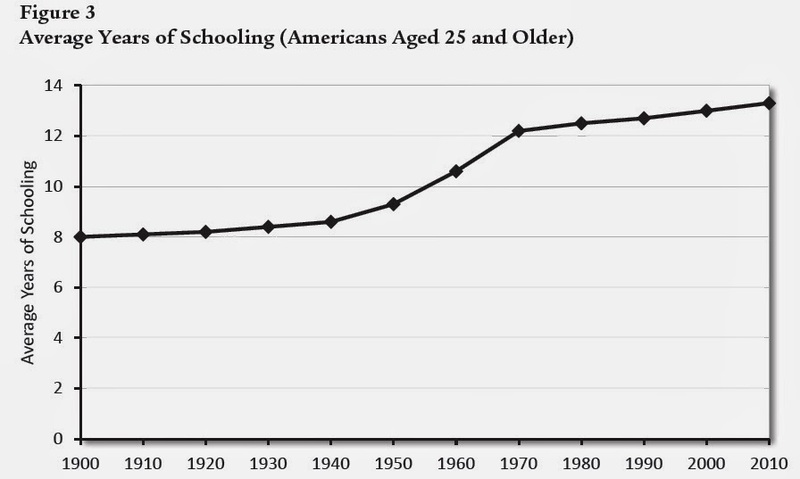 Meanwhile, the rest of the world isn't standing still in expanding educational attainment for their populations. So that leaves us with technology as a potential source of future economic growth. 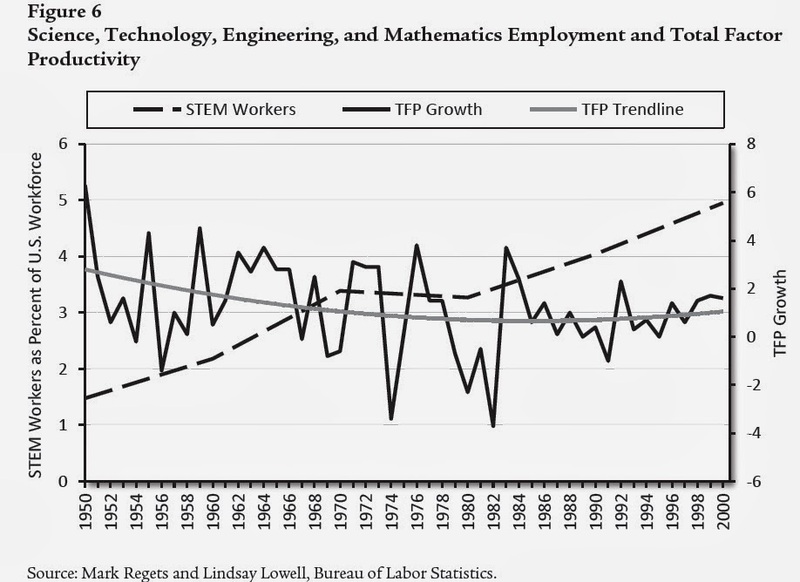 Measurements of productivity are quite volatile, depending on the business cycle, but the smoothed trend line shows that there is no reason to think that productivity growth is trending up. 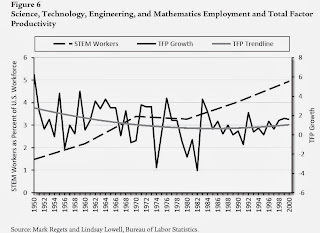 As just a little extra salt in the wound, Lindsey includes a line (measured on the left-hand axis) showing that in fact the U.S. workforce has experienced a rising share of workers in science, technology, engineering, and mathematics. Maybe this has helped to prevent the rate of productivity growth from falling further, but that's the best case one can make. For some perspectives on the controversy about whether a surge of US productivity growth is likely in the future, see here and here. U.S. economy continues to have some enormous strengths and opportunities, of course. For example, the U.S. is uniquely positioned to be a crossroads of the evolving global economy, with the communications and transportation infrastructure, legal and financial industries, and personal and business connections around the world. The possibility that the U.S. could have less expensive domestically produced energy supplies could give the economy a genuine boost. Finding ways for typical jobs in factories, offices, schools, and hospitals to work more effectively with information technology holds the possibility of enormous gains. But at their core, all of these kinds of changes go back to the basic building blocks of workers with an increasing level of skill, working with a rising stock of physical capital investment, finding and adapting new technologies. How important is such a [growth] slowdown? Thanks to the power of compound interest, relatively small differences in the growth rate add up to huge differences in living standards over time. Using the so-called “rule of 70,” you can figure out roughly how long it takes for output per person to double by dividing 70 by the growth rate. Thus, a 2 percent annual growth rate doubles incomes in 35 years, whereas with a 1.5 percent annual growth rate it takes 47 years for incomes to double. Consider the case of a 22-year-old college graduate, just starting in the workplace now. If the long-term average growth rate falls from 2 percent to 1.5 percent, the economy at the time our new college grad retires at age 65 will be almost 20 percent less wealthy than it would have been if the growth rate had remained on trend. As I sometimes like to say, whatever your political goal, whether it is higher spending on social programs or a lower tax burden for citizens, it's easier to achieve that goal when the economy is growing more rapidly.